How are you getting away with that AFN bar with the European Laws on these things? I'm pretty sure those have been banned in the UK because of stupid European Laws protecting stupid jaywalking predestrians? Here in Germany it was no problem at all. 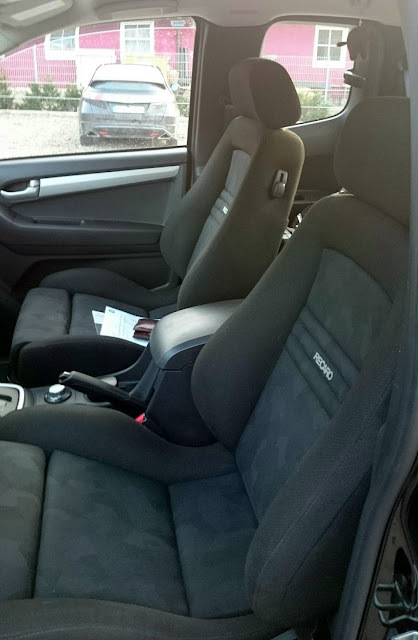 Yesterday i've finally got my new RECARO Ergomed E seats installed. Man, what a difference to the original ones. I really get "assimilated" by my car, when i "enter" the seats. There's a much better response from the chassis now. I (and my old back) love them. Last edited by Dynomike on Mon Feb 01, 2016 4:23 pm, edited 1 time in total. What about the side airbags in the seats mate? are you allowed to just remove them over there or do the Recaros have them fitted? Nope! That was not so easy at all. Because of the seat airbags, i had to look for replacement seats, which also have those. Installing seats without airbags? No way. By the law you are not allowed to decrease a car's security (-features). So there was only one company left: RECARO. Another problem was, that there are no seat consoles available for the D-Max "over here". My Isuzu dealer gave me the address of a company, which builts special seats solutions for handicapped people. They built an own console for Recaro seats in a D-Max, which was tested by the german authorities and is allowed to be used. So it came, that i had to drive 300 kms into deep Bavaria and returned with a smile on my back. Last edited by Dynomike on Mon Feb 01, 2016 4:24 pm, edited 2 times in total. You would have returned with a smile on your back and a very deep hole in your wallet I bet.....although they're probably a couple of hundred bucks over there , over here you'd be lucky to see much change out of $4000...each! In Germany you'll have to pay 4.700,-- Euros for two new seats like mine. Installing included. I could get a pair of two year old ones, in nearly brand new condition, for € 2.000,--. Plus the consoles, installing and the paperwork. At the end it has cost me 1.500,-- Euros less than new ones.